A good, classic floral composition is a thing of beauty. My last great love in that genre is the very hard to find and unfortunately rather expensive Amouage Beloved. I am saving for a bottle, but maybe (just maybe) I have found something that just hits the spot in a similar fashion: Les Fleurs de Nall by Bissoumine (see my mini-reviews of their other perfumes here) is a wonderful perfume that deserves our attention. Les Fleurs de Nall was created by perfumer Kitty Shpirer and released in 2012 and includes notes of citrus zest, green leaves, iris, violet, jasmine, rose, patchouli, moss and precious woods. 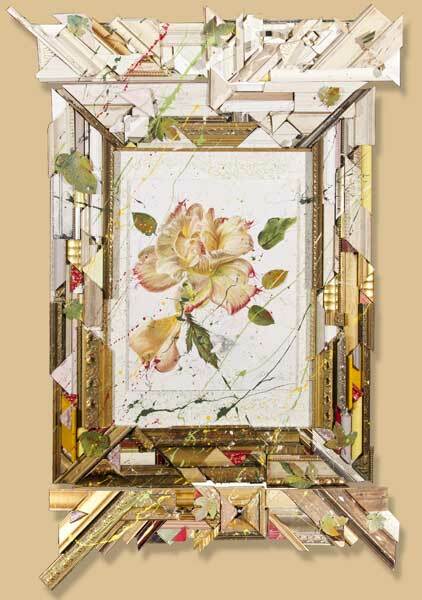 Les Fleurs de Nall was created in concert with the artist Nall, an American painter. The box is decorated with his “Saffron Rose”. Les Fleurs de Nall opens with a full bouquet of flowers, gently gilded with sparkly citrus. The top notes fade and the gorgeous floral heart becomes progressively spicier and woodier over time. It is a delightfully old-fashioned perfume, in the sense that is seems timeless and classic. I would love for Les Fleurs de Nall to have a bit more oomph. A stronger concentration would be perfect. As it is (it’s only available in EdT) it lasts for about four hours on me and the sillage is rather discreet. I have to add that if I had a bottle, I would probably spray a lot less restrained and this seems to be a perfume that needs a good many spritzes to really shine. If it were available in EdP I’d be over the moon. Still, Les Fleurs de Nall is well worth a try. Samples are available via the company’s website for a very reasonable price. Les Fleurs de Nall shows me that it is not helpful to cry about things that are lost forever, but look to the future. As long as perfumes like this are made, all is not lost. There is no need to despair over the seventeenth flanker of some mediocre perfume, we only need to spread the word that small houses do great things. My sample was provided for consideration by the perfumer. This entry was posted in Chypre, Floral, Fragrance Reviews and tagged Bissoumine, Chypre, floral, Fragrance, Kitty Shpirer, Nall, Perfume, Review. Bookmark the permalink. This sounds lovely. I am checking their website now to see about samples. Thank you for the headsup. I love the painting. Birgit, it’s a great find!!! I ordered and received my bottle and it’s very close to Beloved but less aldehydic, more creamy…….but I can tell you one thing, if you have a bottle, spray with caution, it’s very powerful and lasts all an entire day with an amazing projection while it’s “just” an EDT. I’m very glad this tip turned out well for you!!! And so good to hear that sillage and longevity are good when sprayed. 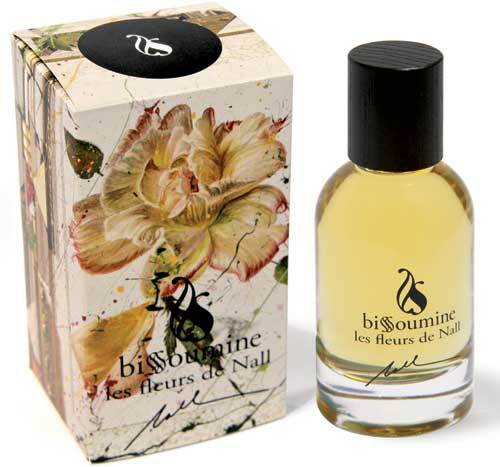 Bissoumine is not very well known, and I was not overly excited about the first batch of perfumes from them that I tried, but Les Fleurs de Nall is definitely worth a sniff, a beautiful find! I’m glad you found a perfume that will do nicely until you get your bottle of Beloved. Thanks for the reminder to try that when I finally get to the Interludes. I’m sure you’ll like Beloved (and Les Fleurs de Nall of course). Sounds fab, and yep really lovely packaging too. I like the bottle, it has that Bottega Venetta simplicity. Sometimes simple is all it takes, I like the bottle too. This sounds quite lovely, and I just checked out their website and saw that they also sell a couple of very pretty silk scarves made in Lyon, France. (I’ve got scarves on my mind lately.) Thanks for making us aware of this line, Birgit. Firstly I must say hello. Your blog has inspired and delighted me for weeks, for months in fact. I adore your writing and I am so pleased that I found you, for you have truly helped to open a window that I have only occasionally dared to peek through before. You see I never knew this world even existed. What I knew of perfumes was that I did my very best to avoid the over-enthusiastic sales assistants that hide behind every column and shelving unit at airports, armed with the latest offering by Britney Spears or Sarah Jessica Parker. Those harsh scents has never given me any pleasure, only headaches and nausea. Yet I have always loved and responded strongly to beautiful scents. Many related to childhood memories, but others that I have come across later in life have made such big impacts on me that I feel certain their memories will never truly fade. But the only scent I ever wore (until recently) was a piece of amber resin that a friend carried back with her from India many years ago. I loved how it changed on my skin, how it responded not only to shifts in temperature but also to my mood. But I left it there. I just couldn’t believe that bottled scents were for me. I never knew that perfumes would one day speak to me, would become one with me. That was until I started poring over your musings. And I was hooked by your beautiful and evocative writing. I became more and more curious. For you manage that which I would have imagined to be almost impossible; to bring scents to life through the hard and soulless medium of the internet. And now? Well now I am much poorer (financially) but also immeasurably richer (in every other sense). Samples. Wow. What an wonderful concept! After these long years of walking in an olfactory desert I am now deeply and irrevocably lost in a beautiful world. So finally, I must say thank you. thank you so much for your wonderful comment! I’m glad you decided to “come out” and talk. Your story is very similar to mine actually, I never knew about this hidden world of perfume on the internet until I stumbled across it almost by accident. It makes me incredibly happy to read your kind words and that you find my writing inspiring enough to go out and try the perfumes. I hope you find many to love and enrich your life, and I hope to talk to you again! I just loved this review…a love letter to this lovely new perfume and toast glories. And naturally after you captured me I must smell this fragrance. Toast glories? iPadeese at its worst. I meant past glories….but a piece of toast with jam does sound enticing. I’m glad I caught your attention, Les Fleurs de Nall surely deserves it! Birgit, how do you find these companies?! I like their samples set so I’ll get it eventually. Thank you for the heads-up. Their sample set is lovely and good value. I will revisit the first six perfumes now, it’s been a while, maybe my perception of some has changed.